The Old Oak In Fog. I fell in love with this painting and had to share it with everyone. I follow Maurice’s blog; it is dreamlike, and mesmerizing and beautiful. Give it a look 🙂 Enjoy! There is a Hank of Beard which is kept at the convent of the white nuns in the far mountains. How it came to the convent no one knows. Some say it was the nuns who buried what was left of his body, for no one else would touch it. Why the nuns would keep such a rewlic is unknown, but it is true. My friend’s friend has seen it with her own eyes. She says the beard is blue, indigo-colored to be exact. It is as blue as the dark ice in the lake, as blue as the shadow of a hole at night. This beard was once worn by one who they say was a failed magician, a giant man with an eye for women, a man known by the name of Bluebeard. They returned home all a -chatter about how interesting the day had been, and did they not have a good time? Yet the two older sisters’ suspicions and fears returned and they vowed not to see Bluebeard again. But the youngest sister thought if a man could be that charming, then perhaps he was not so bad. The more she talked to herself, the less awful he seemed, and also the less blue his beard. So, when Bluebeard asked for her hand in marriage, she accepted. She had given his proposal great thought and felt she was to marry a very elegant man. Marry they did, and after, rode off to his castle in the woods. His bride replied, “Yes, I will do as you ask. It all sounds very fine. So, go, my dear husband, and do not have a worry and come back soon.” And so off he rode and she stayed. Without a thought one of the sisters put the key in the door and turned it. The lock scolded, the dooe swung open, but it was so dark inside they could not see. “Sister, sister, bring a candle.” So a candle was lit and held into the room and all three women screamed at once, for in the room was a mire of blood and the blackened bones of corpses were flung about and skulls were stacked in the corners like pyramid of apples. The wife looked down at the key and saw it was stained with blood. Horrifed, she used the skirt of her gown to wipe it clean, but the blood prevailed. “Oh no!” she cried. Each sister took the tiny key in her hands and tried to make it as it once was, but the blood remained. The wife hid the tiny key in her pocket and ran to the cook’s kitchen. When she arrived, her white dress was stained red from pocket to hem, for the key was slowly weeping drops of dark red blood. She ordered the cook. “Quick, give me some horsehair.” She scoured the key, but it would not stop bleeding. Drop after drop of pure red blood issued from the tiny key. She took the key outdoors, and from the oven she pressed ashes onto it, and scrubbed some more. She held it to the heat to sear it. She laid cobweb over it to staunch the flow, but nothing could make the weeping blood subside. “Oh what am I to do?” she cried. “I know, I’ll put the little key away. I’ll put it in the wardrobe. I’ll close the door. This is a bad dream. All will be aright.” And this she did do. “And how are my storerooms?” he rumbled. “How are my money rooms?” he growled. He put his hand to her face as if to caress her cheek, but instead seized her hair. “You infidel!” he snarled, and threw her to the floor. “You’ve been into the room haven’t you?” He threw open her wardrobe and the little key on the top shelf had bled blood red down all the beautiful silks of her gowns hanging there. The wife raced up the stairs to her chamber and posted her sisters on the castle ramparts. She knelt to pray, but instead called out to her sisters. Bluebeard shouted for his wife again and began to clomp up the stone steps. Bluebeard strode down the hall toward his wife’s chamber. “I am coming to get you,” he bellowed. His footfalls were dense; the rocks in the hallway came loose, the sand from the mortar poured onto the floor. As Bluebeard lumbered into her chamber with his hands outstretched to sieze her, her brothers on horseback galloped down the castle hallway and charged into her room as well. There they routed Bluebeard out onto the parapet. There and then, with swords, they advanced upon him , striking and slashing, cutting and whipping, beating Bluebeard down onto the ground, killing him at last and leaving for the buzzards his blood and gristle. Took a little break from the studio this week to work on some Halloween Projects. 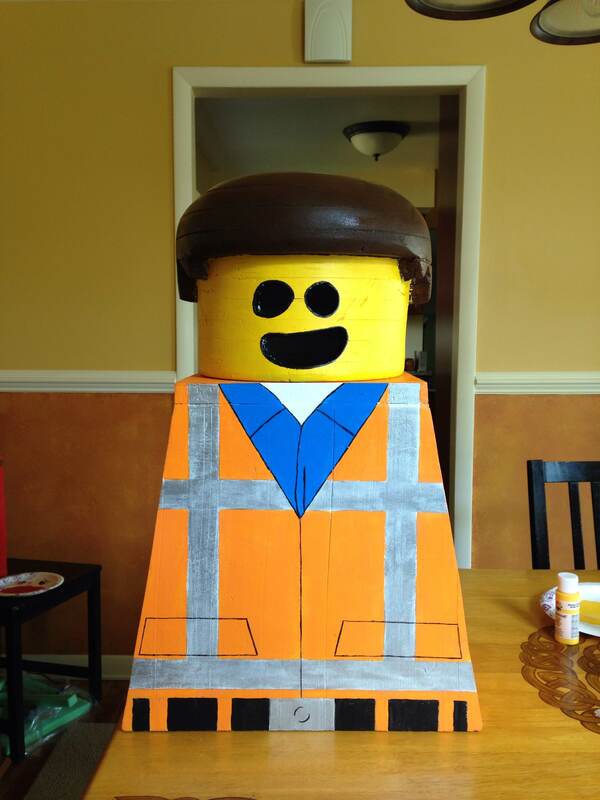 First came costumes for the kids,…Brendan (7) is Emmet from the Lego Movie. Paige (10) is Dorothy from the Wizard of Oz. 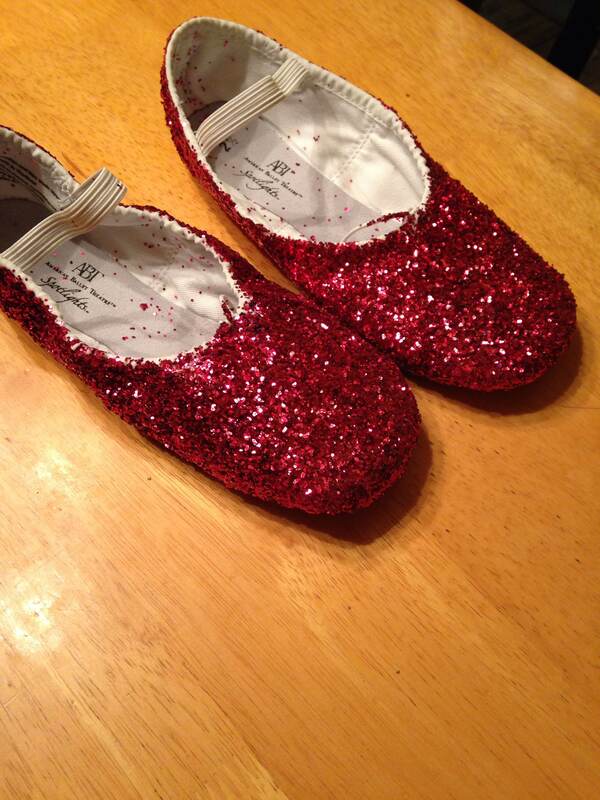 We cheated and purchased her costume but I had to make her ruby red slippers. Then we needed to make ALL of Bren’s costume. 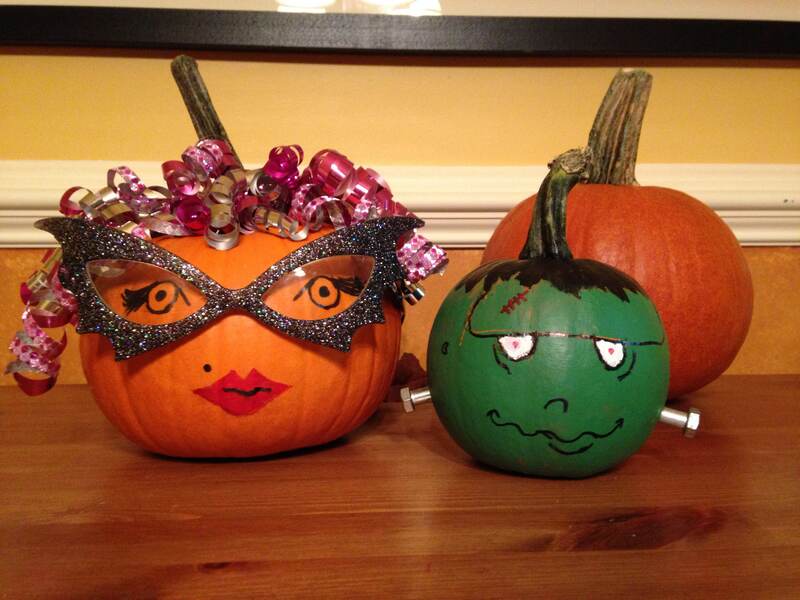 My husband did the carving and construction and I was in charge of the finish work. A very big project but I think they came out pretty good! 🙂 Then tonight the kids decorated their pumpkins for school…no carving allowed. They got really creative. So, while not a whole lot of paint got put down on watercolor paper this week…the paint was indeed flying around here! 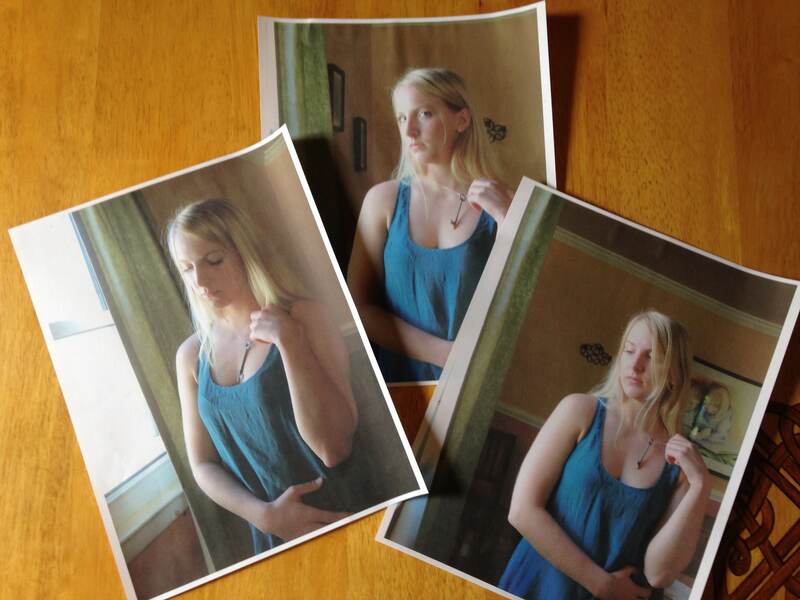 Some of the reference photos of Chelsea for the next painting. And this is only a few of my choices! I think I know which one I want to use,….but then again I might do more than one. Since I am having a hard time deciding, I’m thinking of doing multiple paintings of this subject matter, something I have not really done before. But having too many good references is indeed a good problem to have! Has anyone done the 5 minute journal? It was recommended by artist Lisa Congdon, and you can find it here. It is literally a 5 minute journaling excercise with very simple prompts to guide your writings. It is designed to do in the morning then again before bed. It combines writing about gratitude and affirmations and then a bit of introspection about your day. 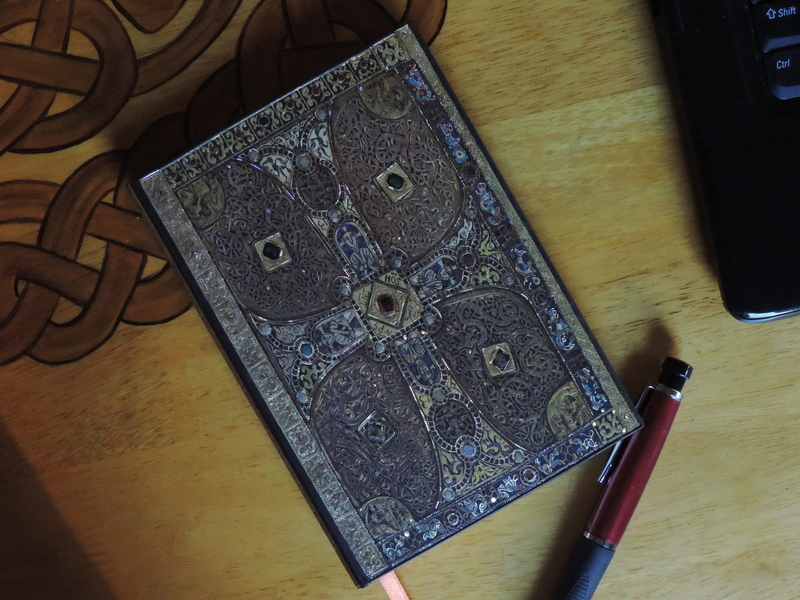 It seems like a perfect way for people who have never journaled before, as well as a good focus for those of us to tend to ramble in our writings. I figured I would give it a try but instead of buying their book I used a blank one of my own. (I often have extra blank journals, I can’t resist buying the pretty ones even if I don’t need a new one 🙂 ) It’s only been a few days, so I guess we’ll see how it goes. If anyone has had a good experience with it let me know!